I’m from Ohio, born on Wright-Patterson AFB and on of my earliest memories is one of me at an Armed Forces Day airshow, sitting in the cockpit of an F-84 with a huge 50’s style flight helmet plopped on my head, and not being able to see over the cockpit sill…I’ve had a love affair with aviation ever since, and the Plank-wing F-84 has been a favorite of mine for many years. 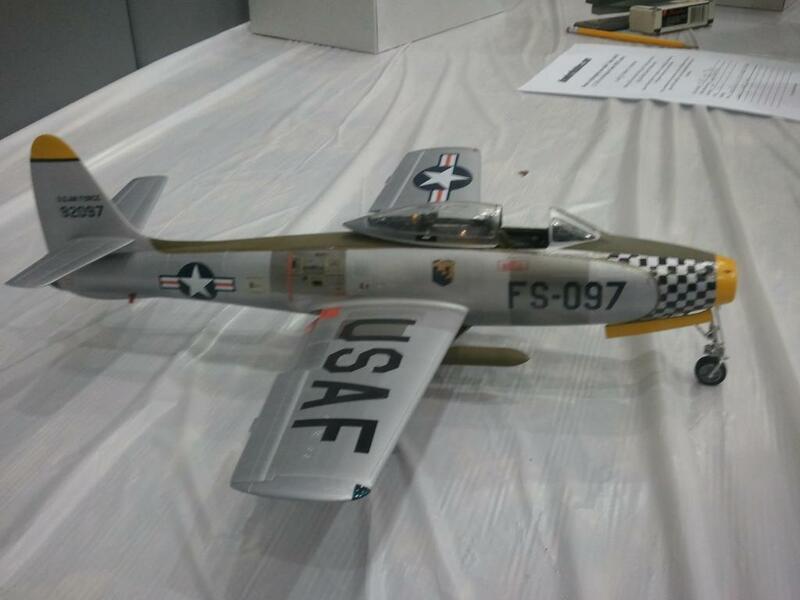 When the Tamiya F-84 came out I built several, converting one to an E model. So when HobbyBoss announced that they were releasing an E and a G I was hopeful…and was not disappointed! The kit itself is beautifully molded and builds easily into an accurate replica. HB has included enough ordnance to outfit a squadron! The kit includes nose weights and Metal landing gear legs, which I highly recommend, as this is a hefty model and the plastic legs are pretty flimsy. 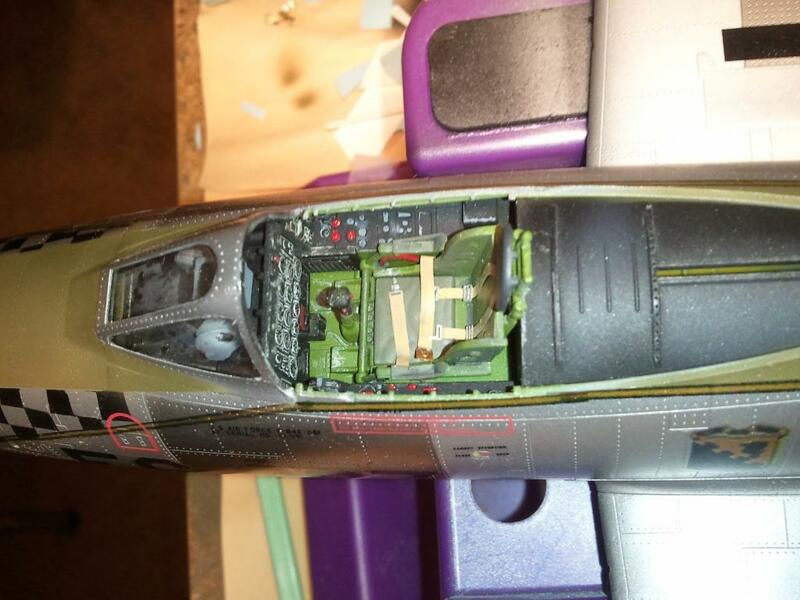 As options you have the choice of early or late bang seats, gun bay exposed or covered, tip tanks or the rarely seen wingtips and just a ton of bombs and rockets to choose from, all nicely molded. The canopy supplied is the later fiberglass-reinforced canopy (later retrofitted to the earlier versions) and the later perforated speed brake. 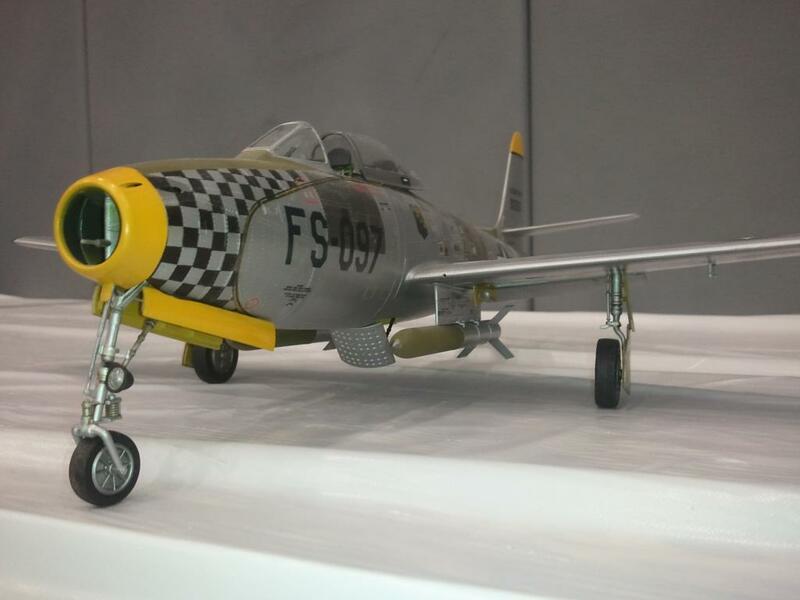 The earlier F-84 models had a slotted speed brake, which curiously is included in HB’s G kit?! Construction proceeded without any issues. I used Blue Magic metal polish to shine up the hard plastic for the natural metal finish that was to come. I planned on building an early F-84 from the late ’40s, prior to the Korean war, without the tip tanks and with the original clear canopy. The kit canopy is molded incorrectly with heavy straps molded on the exterior whereas in reality the reinforcement strips were applied from the inside…so out came the sanding sticks and polishing cloths and after an hour of sanding, polishing and dipping in Future, I had my early canopy! Just proceed slowly and carefully and use Tamiya tape to mask off the framework, and check your progress as you go. I would have thought that with the multitude of markings that the T-jet wore during it’s time in service there would have been more decals available , especially in this scale but well…not so much. HB provides markings for 2 colorful Korean war birds, including one from the 49th FBW, but since I was building a prewar bird I had to get creative. 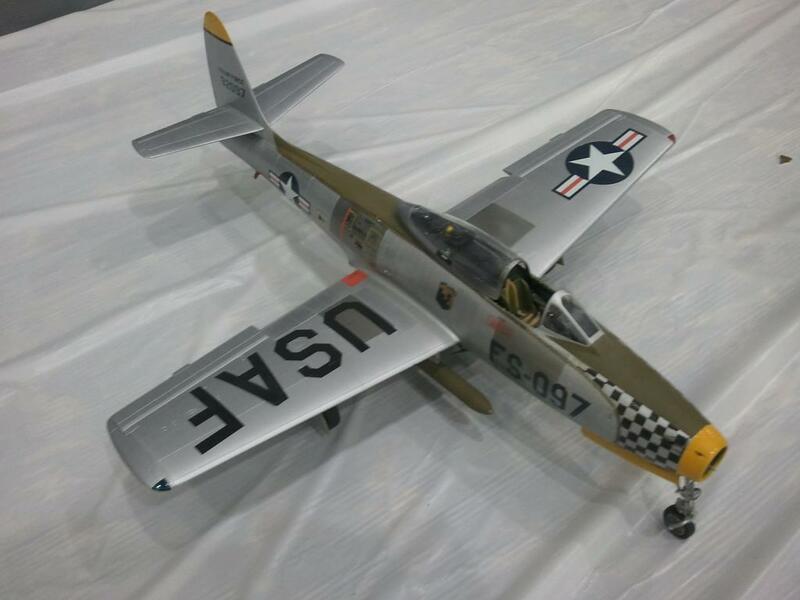 I have R-M’s F-83E release in 1/48th scale ( their second release, not the Pro-Modeler boxing) which had the markings I was looking for, a checkernose from the 31st FG, TAC, Turner AFB Georgia in 1949. So I took the R-M decals, enlarged them to 1/32 scale and printed them on my inkjet both on plain paper and decal paper. I was going to use the inkjet decals for the entire nose but realized that there were too many curves involved…hmmmm…now what? I wound up using the plain paper as masks for the curved edge of the nose trim, cut out a bunch of squares from Tamiya tape, masked the checks and sprayed them with Tamiya semigloss black. After the paint was dry I pulled the masks, applied the yellow trim, A/c numbers, squadron crest and the kit decals to finish up and I had a very unique looking Hog! Just to make my Hog just a little more distinct, I decided to use the Tiny Tim rockets, which made the point that this bird could literally carry every type of ordnance in the USAF inventory. Surprizingly, I found a pair of photoetched exhaust ports I could use on the TT’s on the photoetch fret from Tamiya’s P-51 mustang,as well as several to use on the 4″ rockets. And there you have it! As reference I used Bert Kinsey’s Detail and Scale F-84 Thunderjet, which really is all the ref you need! Enjoy and thanx for letting me share this work with you all! Nice job, Juan….I like it. You have some great articles of your own! Thanx and keep posting! Nice work. Creating an early canopy for that is hard (ask me how I know). I read your article, and remembered what happened! That’s why I took my time and also used some judiciously-placed clay on the inside as well! Another great large scale aircraft from the Benitez factory. And more coming, Al. Some you’ve seen, most you haven’t! Looks cool! The checkerboards turned out well, and it looks very clean without the tip tanks! I have the F-84 book as well, but I wish part 2 with the Thunderstreak and Thunderflash come out soon! Now I’m not a shill, but since you like Republic’s jet, and if you are also a flight-simmer, Sim Skunk Works has a very nice (though difficult to operate) F model Thunderstreak in about 12 liveries from four countries! Back to the model though! 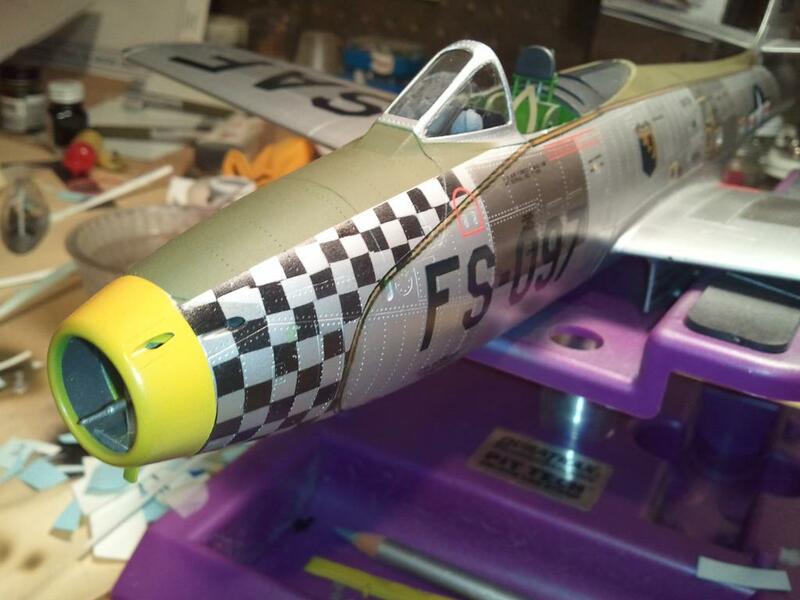 Great work, I am reminded when looking at your model, of the well known author Richaed Bach, who wrote a great book about flying a F-84 across Europe, on a stormy night, carrying a diplomatic bag. Great story told in his special style. what did Republic build after this, was it the mighty F105 Thunderchief? 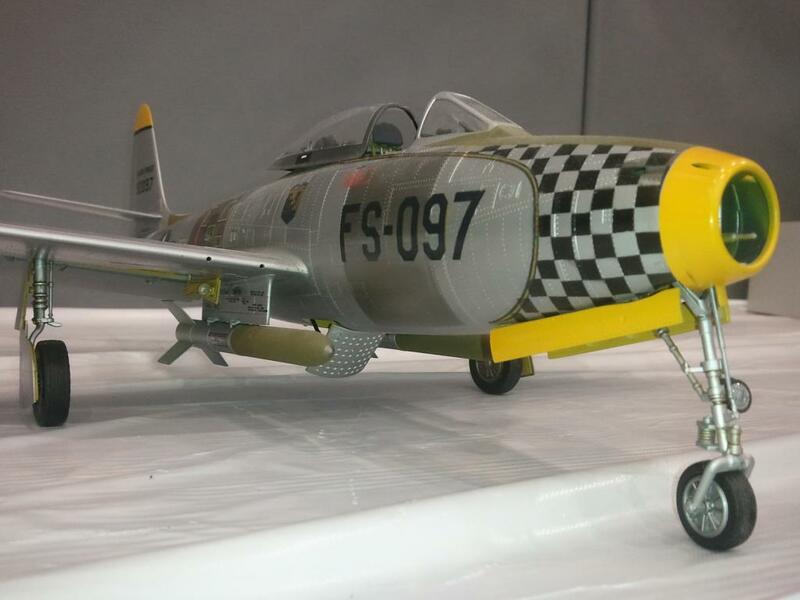 Very nice, a F-84 without tiptanks, looks like an air racer ! Beautiful job, great work on the cockpit. Great job the Juan, like it a lot mate. Thanx again all, for your comments! I appreciate them! Great article, Juan, everything is good, the write up, the pictures, and the best bit is the model! You did an outstanding job on this. The extra efforts you put into it really paid off. I really like what you have done here. Very nice work Juan. I especially like the cockpit & the clear early style canopy. Looks extra sleek without tip tanks too !